In the pressure washing business, there are many options for safety protection which can be accomplished through technology, work practices or administrative procedures. However, there are certain risks inherent in mixing pressurized chemicals with human beings. For this reason, employers are required to ensure that their employees wear personal protective equipment on the job especially working on Ultra high pressure water blasters; a water blaster safety equipment is a must..
Take a moment to think about the kind of risks that your employees face in the course of a busy work day. 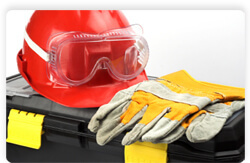 Each risk has its own safety protection gear, and every employer should have the appropriate gear available. Temperature extremes are a constant issue with anyone who works outside for a living. In some regions, the temperatures seem to slide from one extreme to the other. Cold weather requires windproof and waterproof safety protection gear which can cover skin and protect fingers and ears. Hot weather requires loose, breathable clothing and usually some sun shade. In addition to the personal gear, sometimes job sites must be adapted to weather conditions. Crews working in extreme cold should have a warm, dry place to take regular breaks. Conversely, employees working in hot weather ought to have recourse to shade and cold water several times during the day. Airborne objects or compounds are a constant part of pressure washing businesses. Sometimes debris isn't noticed until it gets caught in the stream, and sometimes the stream is sent in the wrong direction. Protecting skin and eyes from solid and liquid projectiles is always required, no matter what the weather. Goggles, gloves, and substantial clothing can prevent eye injury and broken skin, along with the pain and paperwork which accompanies those kinds of injuries. Long pants and long sleeves should be expected even with otherwise safe jobs, as most of the detergents you use will cause some skin irritation, even if they aren't pressurized. Toxic substances are nearly always present in professional cleaning situations. If the nature of a specific job requires head-to-toe coverage, then the clothing should be inspected before each wearing, and it should fit the worker properly. Torn or split garments won't be much protection against a chemical stream, and clothing that restricts movement can be a safety hazard by itself. Before purchasing this kind of clothing, check with the manufacturer to ensure that the clothing is made to protect against the specific chemicals that you are likely to use. Safety protection gear also exists to safeguard respiratory tracts. Any job which produces noticeable amounts of dust should be accomplished while wearing paper masks. If your crew is using detergents or paints which produce toxic fumes, then full masks and respirators will be needed instead. Providing safety protection for yourself and your employees can be expensive, uncomfortable, and in some cases, downright funny looking. Presuming that you are working with grown men and women, though, it shouldn't be a problem to talk about power washer safety tips and to provide your crew with the right equipment.